Don’t be late to the starting line. The next Amazeum on the Rocks is going to be a revved up, high-octane, wild ride sure to get your motor running and fuel your creativity with automotive-themed activities. Hot Wheels™: Race to Win™ will be in our traveling exhibit gallery and it’s full of authentic auto racing artifacts along with those iconic little metal cars. Give your inner child the keys, buckle up, and enjoy a night at the Amazeum geared for adults 21 and up. We invite the young and the young at heart to the 4th Annual Afternoon of Fairytales. Come dressed as your favorite prince, princess or fairytale character and enjoy a style show, dancing with fairytale characters, crafts, face painting, and the ever popular cupcake bar. Children and parents of all ages welcome. 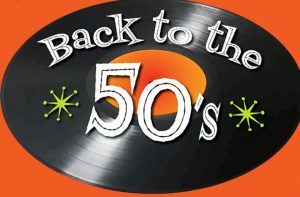 Tickets: Children $10 & Adults $5. Buy three children’s tickets and receive the fourth one free. Tickets can also be purchased at the door. All proceeds support Restoration Village. 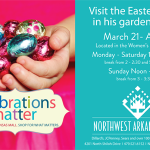 Location: The Avondale Chapel and Gardens in Bentonville. 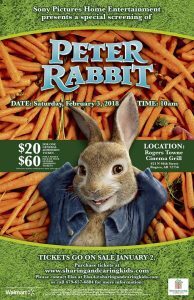 Come see Peter Rabbit before the movie is released to the public; tickets are on sale now. Tickets are $20 for one ticket or $60 for a family pack of 4. Each ticket includes admission, small popcorn, drink, AND a gift bag. Time: Doors Open at 9 a.m. and movie begins at 10 a.m. Celebrate the 20th anniversary of Harry Potter with games, trivia, and more. Dress as your favorite character, visit the brand new Trend Shop, and meet fellow fans. Please Join The Traveling Art Teacher at the Rogers Experimental House and create a one of a kind valentine for your special person. Bring the family; learn how to emboss beautiful tinfoil hearts. Free for everyone. Time: drop in anytime between 1 p.m. and 4 p.m.
Come by for pizza and a movie. 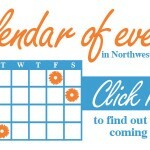 Gather a big group of friends and come to the ninth annual Ooh! La, la! Chocolate & Wine Pairing dinner. The evening will begin with a champagne reception with an artisan chocolate sampling from Markham & Fitz Chocolate, followed by 3 decadent chocolate-inspired courses prepared by Chef Miles James of Miles James Hospitality. Each course will be expertly paired with a fine wine selected by wine expert, Jason Willems of Diamond Beverage Group. Guests will also enjoy the expert commentary of Chef Miles and Jason. Seating is limited, reservations required, $100 per person or $195 per couple. 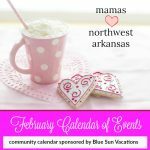 This annual cocktail and fundraising event is hosted by the Junior League of Northwest Arkansas to benefit the community impact focus of UNMASKING domestic violence in Northwest Arkansas. Cocktail attire, festive mask and/or theatrical hair & makeup are strongly encouraged. A prom night you will never forget. Walk the red carpet, enjoy the royal treatment, and dance the night away. Join 4 of your favorite princesses as they put on their favorite poodle skirts and host a Daddy/Daughter Valentine’s Day Sadie Hawkins Sock Hop. Daughters invite your dads to come and dance the night away with you for a Valentine extravaganza. There will be punch and cookies for you and your daddy to sit a sip together, glitter tattoos, a royal rose ceremony for each daddy/daughter couple, love songs performed by your hosts, Valentine’s day story time, a valentine’s day card craft to give to that special family member when you return home, picture frame craft for that special photo of you and you’re daddy, and of course we will boogie down. Tickets are $30.00 per couple and any family member combination is welcome. 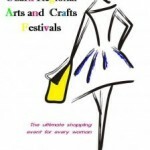 Two sessions will be offered for this very popular event. Dates/times: Session One: Friday Feb. 9th 6 p.m. – 7 p.m. and Session Two: Saturday Feb. 10th 10 p.m. – 11p.m. This event is hosted by Grace & Truth International at the Pack Shack. Each Kindness Kit purchased/made will help the homeless community in NWA and will also feed families in need in Romania. Each Kindness Kit is $12 to make and take or Grace & Truth will distribute them for you. Anyone can help, including kids. Two weeks before the event there will be a link to pay ahead or pay for the ministry to prepare. Payment on the day is also available. Little Duck and all of her friends on the farm celebrate Valentine’s Day by inviting a newcomer to join in the fun in this charming addition to the award-winning Click, Clack series from the New York Times bestselling and Caldecott winning team who brought you Click, Clack, Moo and Click, Clack, Surprise! Activities to follow. Do something unforgettable with your loved one on Valentine’s Day weekend. Share the wonders of nature on beautiful Beaver Lake looking for bald eagles plus enjoy a scrumptious and a musically fun lunch at Ventris Trails End Resort. Cost: $40+ tax per person: Reservations and prepayment necessary. Contact Hobbs State Park – Conservation Area to reserve your spot. Call (479) 789-5000. Time: Each cruise will leave the marina promptly at 11:00 am and return at 2:00 pm. 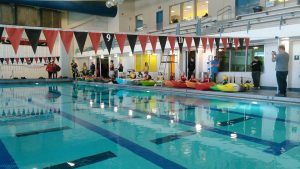 Family Kayak Course at the Jones center. The first clinic is self & assisted rescue. This is the most important for families to learn to help each other. Second is Basic strokes & third is the rest of the strokes then maneuvers. What a fun way to start your family adventures for 2018. Tickets start out at $99 for all three dates, Kayaks & gear available for $20 extra. Ages 7yrs up. Email rob@arkansasoutdooroutfittes.com to get your families tickets today. Anime & manga lovers are invited to come by for pizza, anime, and fun crafts and activities. Come hang out with other people who like the same things you do. Adopt Love this Valentine’s Day. Come out for an adoption and fundraising event benefitting Springdale Animal Services & Fayetteville Animal Services. Tickets include a pizza and pasta buffet, Flyway Brewing beverage ticket, raffle ticket and the chance to meet your new love. Both shelters will be offering $14 adoptions for connections made at this event. Teens – can you decipher the clues in time to escape? Come find out. Child Care Aware is a free referral service that helps families in 17 counties find childcare and provides parent education class. Stop by the open house to find out more about local child care options. Child Care Aware is a non-profit resource center. 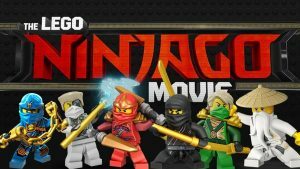 February’s movie is a family-favorite, The Lego Ninjago Movie. This is a totally free movie screening in the auditorium. Young Actor’s Guild of Fort Smith presents “Wonderland: The REAL Story” an adventure with the characters from “Alice in Wonderland” & a few beloved characters from other fairytale stories as well. Production will be held in the Library Gallery. Timed 5k/10k, Riddle Fun Run. All proceeds from the race support the scholarship fund. Prizes are family oriented including awards for the top three teams. Children ages 3-5 years old and their favorite adult will become keen explorers of their world. 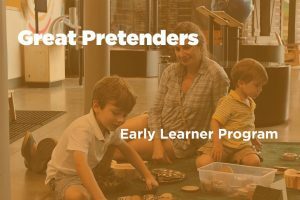 This collaborative experience is filled with engaging activity zones that inspire curiosity, skill-building and new ideas to grow on. Play = Learning at every workshop. Members $10 | non-members $15. Elevate the arts in downtown Springdale with a night to remember. Enjoy live music curated by the Fayetteville Roots Festival, culinary masterpieces provided by top local chefs, auctions, raffles, entertainment, and much more. Walton Arts Center’s Joy Pratt Markham Gallery exhibition, “The Grammar of Ornament” . The exhibition will feature the artwork of Shepard Fairey, Ryan McGinness, and Mary Judge, as well as work sampled from Owen Jones’s The Grammar of Ornament and William H. Page’s Specimens of Chromatic Wood Type. Camp Kesem is a national non-profit organization that provides a free week of camp to kids who have been affected by a parent’s cancer. Locally, there’s a chapter at the University of Arkansas. Make the Magic is a fundraising gala to support the free week of camp for local kids.